This booklet is in both English and Norwegian language and contains written patterns, charts and photographs for Sundrops sweater and earwarmer for women and children. This pattern is in children’s size , and it is available in Norwegian language only. It consists of one file with written instructions, chart and photos. This pattern is in women’s size , and it is available in Norwegian language only. It consists of one file with written instructions, chart and photos. This pattern is in men’s size , and it is available in Norwegian language only. It consists of one file with written instructions, chart and photos. This pattern is in womens size , and it is available in Norwegian language only. It consists of one file with written instructions, chart and photos. Please note: This pattern is in Norwegian only and consists of one file which includes both written pattern and chart. This pattern is in childrens size , and it is available in Norwegian language only. It consists of one file with written instructions, chart and photos. This pattern is for Sundrop beanie. The pattern is available in Norwegian only. It consists of one file with written instructions, chart and photos. NOTE: The mustard yellow color is unfortunately no longer a part of Istex’ Lettlopi color chart. This pattern is in womens size , and it is available in Norwegian language only. It consists of one file with written instructions, chart and photos. NOTE: The mustard yellow is unfortunately no longer to be found in Istex’ Lettlopi Color Chart. This pattern is in womens size , and it is available in both English and Norwegian language. It consists of one file with written instructions, chart and photos. This pattern is available in both English and Norwegian language. It consists of one file with written instructions, chart and photos. This pattern is in childrens size , and it is available in both English and Norwegian language. It consists of one file with written instructions, chart and photos. 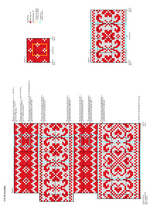 This pattern is in Norwegian only and consists of one file which includes written instructions and photos. This is a pattern for Hot Knot Tunic. The pattern is in Norwegian only (for now) and consists of one file which includes text and photos. This is a pattern for Jet-lagged sweater. The pattern is in Norwegian only (for now) and consists of one file which includes text and photos. This is a pattern for Snow Day leggings. The Snow Day sweater will be published mid March. Then it will be possible to buy both patterns in a booklet at a reduces price. The pattern is in Norwegian only (for now) and consists of one file which includes text and photos. This is a pattern for Snow Day sweater. The pattern is in Norwegian only (for now) and consists of one file which includes text and photos. This pattern is in Norwegian only. The suggested gauge is measured before the felting process. Dette mønsteret er på norsk og består av én fil med oppskrift i tekstformat og mønsterdiagram. This pattern is for the woman’s cardi Festival Fun. The pattern is in Norwegian only and consists of one file, which includes both written pattern and chart. This pattern is for the mens cardi Festival Fun. The pattern is in Norwegian only and consists of one file, which includes both written pattern and chart. This pattern is in Norwegian only (English translation will be published during May 2017) and consists of one file which includes photos and written pattern. This pattern is a free pattern, but in Norwegian only. As for now, I have no plans for having it translated into neither English nor any other languages. This pattern is in Norwegian only and consists of one file which includes both written pattern and chart. This pattern is in Norwegian only. As for now, I have no plans for having it translated into neither English nor any other languages. This pattern is for Twilight blanket / Skumring. The pattern is available in Norwegian only. It consists of one file with written instructions, charts and photos. This tutorial is in both English and Norwegian.